Caldric Blackwell is the author of the middle-grade novel "The Sacred Artifact," the second and final book in the Young Alchemist series. Describe your new middle grade fantasy novel, The Sacred Artifact. 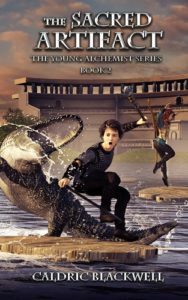 “The Sacred Artifact” follows fourteen-year-old alchemy student Craig Pike, his teacher, and a witty archer, named Audrey Clife, as they journey to the birthplace of alchemy to unravel the secret of an alchemical artifact. Their journey takes them to dangerous-yet-mystical lands where they realize the artifact has more powerful than anticipated, and they aren’t the only ones seeking to discover its secrets. Who would enjoy “The Sacred Artifact”? Or the Young Alchemist series in general? Anyone who enjoys a good middle-grade novel will enjoy the series. It’s aimed at ages ten to fourteen, although younger and older readers can certainly enjoy it. There’s plenty of fantasy, action, adventure, and mystery in the series. Additionally, the cast of characters have some interesting dynamics. How was the experience of writing “The Sacred Artifact” different from writing the first book in the series, “The Missing Alchemist”? Well, it was different in a number of ways as well as similar in a number of ways. In “The Missing Alchemist,” I introduced readers to Craig Pike and Audrey Clife and the world they live in. In “The Sacred Artifact,” readers are already familiar with the protagonists, so I could focus more on developing the world and introducing a cast of new exciting characters. Readers also get the opportunity to learn more about the history of alchemy and even see where Cornelius, the famous alchemist in book one, trained … and meet his teacher! With any sequel, there’s the risk that you’ll lose the magic of the first book, particularly among die-hard fans. Was that a concern of yours? There’s always that possibility in sequels. A lot musicians face the same thing. People say, “The old stuff was better.” I didn’t write the second book really worried about it, though. All the magic of “The Missing Alchemist” I carried into “The Sacred Artifact.” I just made it bigger. You get to know Craig and Audrey even more. You get to see more of the world. And a lot of the questions raised in the first book get answered. Plus, there’s even more action, adventure, and cool places, as well as some really interesting new places. In “The Missing Alchemist,” readers got a taste of alchemy. Is there more alchemy in this book? Absolutely. Readers get to see the birthplace of alchemy itself and are introduced to more alchemists. Additionally, a lot more of the mechanics of alchemy are explained. In “The Missing Alchemist,” Craig was still very green in his experience with alchemy. In “The Sacred Artifact,” the reader gets to follow as Craig progresses with his alchemy training, including learning about metallurgy. There’s even some chemistry stuff in there. Are there any new characters you enjoyed writing? Yes! Quite a few actually. One of the things I enjoyed about this book was really expanding the cast of characters. There’s a character named Captain Charla. She’s a boisterous, no-nonsense captain of charter boat in a swamp region. She has a great sense of humor, so it was fun trying to capture her for the reader. Another character I enjoyed writing is Quintus. He’s a wise, ancient alchemist who actually taught Cornelius. He’s very reserved and contemplative, and it was a nice challenge trying to relay this in his dialogue. He plays an important role in the plot, so I wanted to do him justice. Did you have any goals for this book? I had a few. I wanted the readers to get more experience with the characters they loved in the first book. I wanted to expand Craig and Audrey’s world, and I wanted to flesh out more of the alchemy history hinted at in the first book. And of course, as the final book in the series, I wanted to ensure readers had closure when they finished. Most importantly, though, I wanted to write a fun, enthralling book that really stimulates the reader’s imagination. Speaking of it being the final book in the series, what was the experience like writing the last line? Good question! I experienced a mixture of emotions. Although the series isn’t very long, I’d spent years with the characters by the time I finished it. So in a sense, there was some sadness seeing the story coming to an end, and there was some nostalgia remembering when I first started the series. There was also a sense of joy and satisfaction. I feel I really did the characters and the story justice, and I am excited to have the opportunity to share it with the readers. I’m currently working on a young adult book. I don’t want to say too much about it right now, but it’s quite different from my other projects. Anyone interested in learning more about The Sacred Artifact or any of my other books can find more information at www.caldricblackwell.com.